The 33.80-carat drop-shaped pearl of Polynesian origin gets its name from its onetime owner Mary Stretch Irick Drexel, the renowned philanthropist, connoisseur and collector of jewels and jewelry, and a patroness of the arts. Mary Stretch Irick Drexel (1868-1948) was the wife of George W. Childs Drexel (1868-1944), who was the youngest son of Anthony Joseph Drexel (1826-1893), the famous American financier, banker and partner of J.P. Morgan, and the founder of Drexel University. The present Belle Epoque pendant-brooch setting in which the Drexel Pearl is incorporated, was actually designed and executed in 1905, by the American branch of the French-based internationally renowned jewelers, Cartier's, after the firm was commissioned by Mrs. Mary Stretch Irick Drexel for the task. The Drexel Pearl is a perfectly symmetrical natural drop-shaped black pearl of Polynesian origin, having a weight of 6.76 grams equivalent to 33.8 carats or 135.2 grains. The perfect symmetry of this drop-shaped pearl is astonishing, being a natural pearl, and is indeed regarded as a marvel of nature. The pearl is considered a black pearl, for which the Polynesian region is world renowned, but the body color of the pearl is actually a subtle gray color with a pinkish overtone, which provides a perfect background for the silvery iridescence caused by the interference of light as it passes through pearl's nacre. The combined properties of perfect symmetry, the subtle gray color and the orient of its smooth surface, makes the Drexel pearl an extremely rare and famous pearl, in spite of its relatively smaller size compared to other famous pearls. In addition the historic provenance of the pearl also enhances its standing as a famous pearl, and greatly increases its value. The pearl has a length of 29 mm, a maximum width of 13.65 mm and a minimum width of 12.20 mm. A complementary pearl in the Belle Epoque pendant-brooch, set as the centerpiece of the brooch, has a comparable grayish color, but is almost spherical in shape and has weight of 12 carats equivalent to 48 grains, and dimensions of 12.85 x 12.90 x 10.30 mm. The Drexel Pearl is still preserved in its 1905 setting, which is a Belle Epoque pendant-brooch. Belle Epoque, meaning "beautiful time" in French, refers to the Edwardian period, the time of reign of Edward VII of England (1901-1910), a time when elegance and fashion became predominant values in society. Edward VII ascended the throne of the United Kingdom, following the death of his mother Queen Victoria in 1901. Queen Victoria ruled for 64 years from 1837 to 1901, and after the death of her husband Prince Albert in 1861, went into self-imposed mourning that lasted till the end of her reign. The ascension of Edward VII in 1901, was a welcome change, that ushered in an era of elegance, frivolity and fun, after Queen Victoria's long period of mourning. During this period, the upper and middle classes acquired new wealth, and the automobile, the airplane and the movie industries were born. Even though Edward VII died in 1910, the Belle Epoque period continued until the onset of World War I. The jewelry styles of this period were light and delicate, as much as the clothing and fashions of this period which made use of delicate fabrics, lace and feathers. Platinum was introduced as the principal metal in jewelry making, which enabled the manufacture of lightweight designs. Invisible settings were created which made use of a minimum of metal to hold gemstones. Diamond and pearls set in platinum were favored, because of the white on white color scheme. The platinum enhanced the radiance of diamonds and pearls. Diamonds of the period were rose, mine or European cut diamonds. Long strings or chains of pearls were worn in combination with chokers. The most popular gemstones of the period were sapphire, peridots, chrysoberyls and amethysts. Peridot was the good luck stone of Edward VII, and jewelry set with peridot became popular during this period, resulting in the production of some remarkable peridot jewelry. Amethyst was the favorite stone of Queen Alexandra, and was often included in jewelry of this period. Green peridots, White pearls and Violet amethysts, were combined together in women's jewelry; the Green, White and Violet colors representing the colors of the suffragette movement; the first letters of the colors, G, W, and V standing for "Give Women the Vote." Jewelry of the period were graceful, decorated with openwork garland, lace, tassel and bow motifs. Necklaces with lavaliere and negligee pendants were widely used. The negligee pendant, consisted of two drops of unequal length suspended from a centerpiece. Circle brooches and bar pins, with lacy filigree designs were very fashionable. Stars and crescents were also popular. The Belle Epoque pendant brooch is a circle brooch characteristic of the Edwardian period, with diamonds and pearls set in platinum. The Drexel Pearl is suspended as a pendant from the lower end of the brooch, by a hook fixed to the narrow end of the elongated drop-shaped pearl. The brooch itself is made up of two concentric circles of platinum mounted with rose-cut diamonds. The outer and inner circles of the brooch are mounted with 40 diamonds and 30 diamonds respectively. The interior of the inner platinum circle, which is the centerpiece of the brooch, is occupied by an almost spherical pearl, complementary to the drop-shaped Drexel Pearl, and having the identical subtle grayish color. It is the combination of these two grayish pearls with their silvery overtones that makes this circular pendant-brooch an outstanding piece in its class, and a superb example of a brooch of the Belle Epoque period. The Natural Black Pearl - The "Pearl of Queens" and the "Queen of Pearls"
In the History of mankind no other gemstone or metal had captivated people more than the natural pearl, a gem perfected by nature and requiring no art to enhance their beauty, a true gift of nature to mankind. The beauty and rarity of pearls enhanced their value, and later became symbols of status, power and prestige. Little wonder that pearls became the favorite of royalty and aristocracy since ancient times. In the history of Great Britain, one of the best known lover of pearls was Queen Elizabeth I (1533-1603), who had a special preference for pearl-embroidered dresses, of which she is reported to have owned over 3,000. Over her pearl-embroidered dress she usually bedecked herself with seven long beaded pearl necklaces, and also wore matching drop-shaped pearl ear-pendants, and 10 pairs of matching pearls mounted on the surface of her elaborate hairdo. Please see photograph below. Most of these pearls undoubtedly originated from the ancient and historic pearling grounds of the Persian Gulf, Red Sea and the Gulf of Mannar. 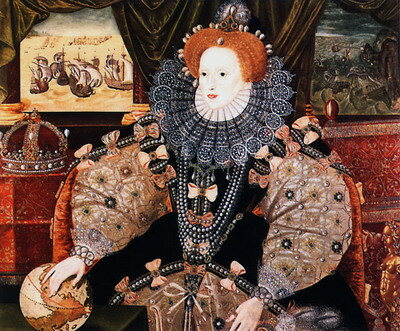 Perhaps in her vast collection of pearl jewelry and pearl-embroidered dresses, Queen Elizabeth I might also have owned some pieces made up of the rarer black pearls, such as necklaces, also of Persian Gulf origin. The Persian Gulf was one of the first pearling grounds in the world where the black pearls were first discovered, originating from the bivalved mollusk Pinctada margaritifera, the black-lipped oyster, native to the waters of the Gulf. The black-lipped oyster has a wide geographic distribution, and besides the Persian Gulf and Polynesia, are found in the waters of Australia, Fiji, the South Sea, Baja California and the Gulf of Mexico. Empress Catherine the Great of Russia (1729-1796), a great connoisseur and collector of jewels and jewelry, was reported to have owned a valuable black pearl necklace made up of 30 black pearls, the largest of which weighed 19.5 carats or 78.0 grains. It was also reported that the Austrian Crown of the Habsburg dynasty in the 18th century, was set with 30 black pearls. The French Empress Eugenie de Montijo (1826-1920), the Empress consort of Emperor Napoleon III (1808-1873), who was said to have reset most of the French crown jewelry in new settings to suit her taste, and also enriched the French crown jewels by adding several exquisitely designed new pieces, also added a valuable black pearl necklace to her collection, the pearls believed to have originated in French Polynesia. Hence the natural black pearl came to be known as the "Pearl of Queens" and the "Queen of Pearls." The Drexel Pearl is believed to have originated in the islands of the French Polynesia, whose waters constitute one of the natural habitats of the bivalve mollusk, Pinctada margaritifera cumingi, commonly known as the "black-lipped" oyster, which produces the rare black pearl, that was greatly valued by pearl enthusiasts, and connoisseurs since ancient times. It is around this species of bivalved mollusk that the present day cultured pearl industry of French Polynesia that produces the famous black Tahitian pearls is based. French Polynesia consisting of 118 volcanic and coral islands and atolls, occupying an area as big as Western Europe, in the South Pacific, somewhere midway between Australia and South America, is a French Overseas Collectivity, administered as an overseas country inside the French Republic, with representation in the French National Assembly and Senate, and the people as French citizens given the right to vote in the French presidential elections. The total land area of all the islands is 4,167 sq. km. scattered over 2.5 million sq. km. of ocean. The islands can be divided into five island groups. These island groups are :- 1) The Society islands 2) The Tuamotu archipelago 3) The Gambier islands 4) The Marquesas islands 5) The Tubuai islands. The largest and most densely populated island is Tahiti, which is part of the Society islands group. The capital city Papeete is situated on the main island Tahiti. The various Polynesian islands were discovered within a period of about 250 years, starting from early 16th century (1521) to the late 18th century (1767), by European explorers from Portugal, Spain, Netherlands, Britain and France. Missionary activities to convert the indigenous population to Christianity began in 1774 by the Spanish Catholic missionaries, followed by the British Protestant missionaries in 1797 and finally by the French Catholic missionaries in 1834. The expulsion of the French Catholic missionaries in 1836 led France to intervene in 1838 by sending a gunboat. In 1842, France declared Tahiti and Tahuata islands as French Protectorates, to enable the Catholic missionaries to continue their work without any hindrance. The French founded the capital of Papeete in 1843. In 1880, France annexed Tahiti, changing its status from a protectorate to a colony. By 1885, France had annexed the five Island groups and after the appointment of a governor to administer the newly found colony, named it "Settlements in Oceania." In 1903 the name was changed to "French settlements in Oceania." In 1946 after World War II, Polynesians were granted French citizenship, and the island's status changed to "French overseas territory," and the name changed to "French Polynesia" in 1957. In the year 2004, the status of French Polynesia was again changed to "French Overseas Collectivity." French Polynesia today has been granted autonomy in all areas of government, except defense and foreign affairs, immigration, monetary policy, police, justice, and tertiary education. Ancient Polynesians like the ancient Indian tribes of the New World, and other ancient civilizations of the world, were well aware of the existence of pearl oysters, which they used not only as a source of food, but also for the production of ornaments. They appreciated not only the natural beauty of pearl oyster shells but also the rare and occasional pearls found inside the shells. Besides being used for decorative purposes, such as ornaments, the pearl shells also had other uses such as the making of household utensils and fish hooks. However the organized collection of pearl shells in Polynesia, one of the most beautiful in the world, began only in the early 19th century, after the arrival of European navigators and traders. The Polynesian islands provided an alternative source for pearls and pearl shells, apart from the Persian Gulf, the Red Sea and the Gulf of Mannar; pearls obtained from the New World regions such as the Caribbean, Gulf of Panama, and Venezuela being totally exhausted due to over exploitation. Tuamotu archipelago, the island chain where pearl oysters were first exploited, and the main source of the "Tahitian Pearls"
Out of the five island groups of Polynesia, it was in the Tuamotu Archipelago, the natural breeding ground of the black-lipped oyster, that pearling had first developed as an industry since ancient times. The islanders of the archipelago knew the decorative and commercial value of pearls, and were the first to exploit the abundant pearl oyster resources available in the islands of the archipelago. The island chain of the archipelago, consisting of 78 circular reef lagoons or atolls is situated about 300 km east and northeast of Tahiti. The atoll lagoons are surrounded by chains of low islands called motu, which rise above sea-level, and are linked by sandbars. Some of the important atolls are Fakarava, Rangiroa, Manihi, Tikehau and Hikueru. Natives of the Tuamotu archipelago used pearls in their barter trade with the people of Tahiti who visited the archipelago regularly, and obtained goods which were in short supply or not available on the coral atolls, such as adzes and axes made of basalt. In Tahiti this barter trade with the Tuamotu islanders was controlled by the royal family, as for instance during the reign of Tahiti's regent, "Pomare Vahine" who was regent to the young king Pomare III, who sent out big twin-hulled Polynesian sailing canoes from Tahiti to the Tuamotu atolls. In ancient times in Tahiti, pearls, shells, turtles and other objects of special interest and value were also given as gifts to members of the royalty and tribal chiefs, as a form of payment to compensate for the compulsory collective service to the community, expected from each family. The pearls so collected by the royal family was sold to the foreign explorers and traders who visited Tahiti; a pound of pearls fetching a prize of about 100 gold louis. These pearls eventually reached the capital cities of western nations, where they were traded as Tahitian pearls, even though they actually originated in the Tuamotu archipelago. This type of barter exchange continued even after the arrival of the Europeans but the basalt axes were replaced iron goods such as axes, knives, nails and hammers. Why Tuamotu islanders did not use pearls as ornaments ? The European explorers who discovered the different island groups of Polynesia, found that pearls were used as an ornament by most of the Polynesians living in the different groups of islands, except in the Tuamotu archipelago, one of the most favorable places in Polynesia where pearls could be found. This apparent contradiction was later found to be not a matter of choice but rather one of technological advancement. The islanders simply did not have the technical know-how to pierce a pearl, in order to convert it to a bead for a necklace, or make it a part of a pendant or earring. Bora bora an island of the Society Islands group, were the first to develop the secret of piercing a pearl. This explains why pearls became part of the finery of the Society islanders but not the Tuamotuan islanders, who instead used their pearls as a medium of exchange for goods from the Society Islands. However, with the arrival of the European navigators, the Tuamotuan islanders learnt to use iron nails for piercing pearls, although initial attempts to perfect the method resulted in the chipping of large numbers of pearls. European discoverers such as Capt. Samuel Wallis (1767) and Lt. James Cook (1769) who had purchased pearls from Tahitians, had reported seeing several high quality pearls of good color and orient, but unfortunately chipped by piercing attempts. When the French navigator Bougainville arrived in Tahiti in 1768, the Tahitians scaled down the trade in Pearls, perhaps being suspicious of his intentions. Bougainville wrote "I know of only one rich article of trade here; they are the beautiful pearls. The wives and children of the Tahitian chiefs decorated their ears with pearls, but they hid them during our stay." In 1775 when Maximo Rodriguez arrived in Tahiti, he was greeted by members of the royal family, one of whom wore two pearls, each as big as a chick pea, but both crudely pierced. According to Rodriguez pearls found during this period varied in size and quality. The size varied between a chickpea and almond, and the surface of the pearl could be notched, uneven and deformed or without flaws. The orient of the pearls also varied from a minimum to a maximum. Rodriguez further goes on to write that pearls were owned mainly by the Tahitian Chiefs and members of their families. The pearls were mainly used as earrings and decorations for clothing. Each earring known as "Poe" in Tahiti, was made up of three pearls, worn at the end of a cord 5-8 cm long and made of braided hair known as "tipua." Pearls were worn by both Tahitian men and women, who had both their ears pierced, but usually wore only one earring at a time. Some of the pearl earrings found their way to Europe after they were purchased from their royal owners. The Duchess of Portland had two ear ornaments in her collection made up of six pearls originating from Tahiti. The Gottingen Museum also had a pair of pearl ear ornaments, and the Cambridge Museum had a pearl pendant dating back to Cook's first or second voyage to Tahiti. The Tahitians considered the pearl ornaments as valuable possessions, and would not part with them easily even when attractive offers were made for such ornaments. This was the experience of Joseph Banks, who accompanied Cook on his voyages, when he wanted to purchase an ear pendant of three pearls from a Tahitian girl. She refused to sell them in spite of the fact that he offered anything she wanted. The first accounts of the exploitation of pearl oysters for their shells, used in the manufacture of buttons and as inlay, dates back to 1802. According to these accounts the lagoon reefs where the pearl oysters were collected were extraordinarily rich, that collectors needed only to wade into the water up to their waist, in order to collect several hundred kilos a day. However, it was only around 1820, that pearl shell collection actually became a big time business. Tuamotu archipelago, the first island group where pearl oysters were exploited by the islanders for their pearls even before the arrival of the European explorers, once again became the center of large scale exploitation for pearl shells, and became an international meeting point for pearl shell traders from England, America and Belgium. Diving for pearls oysters were mainly carried out by the islanders, and some foreigners from neighboring islands, such as the Cook Islands and the Pitcairn Islands. The local divers were paid for their work in European goods, such as muskets, gun powder, knives, clothing material and alcohol. "Pomare Vahine" Tahiti's woman regent for Pomare III, who was underage, imposed a tax on the collection of pearl shells in 1825, by decree, that also stipulated that royal permission had to be sought before collection started. Ships that violated the royal decree were seized. Statistics reveal that on an average, around 900 to 1,000 tons of pearl oysters were collected annually from the year 1820 to 1880, and the price paid in London for a ton of pearl oysters was around 13 gold louis. The peak production of pearl shells was between the years 1845 and 1879, after France declared Tahiti and Tahuata islands as French protectorates in 1842. After the year 1880, production declined sharply, as the lagoons were virtually empty, with the exception of the most remote ones. Even though the pearl oysters were mainly harvested for their shells, the occasional pearls discovered from the oysters, with a frequency of one in every 10,000 to 15,000 oysters, entered the pearl markets of Europe. The Tuamotu archipelago which formerly belonged to the Pomare dynasty and was administered by them from Tahiti, was claimed by France only in the 1880s. By this time most of the pearl resources of the archipelago was already exhausted. Was the reef-lagoons of the Tuamotu archipelago the actual source of the Drexel Pearl ? 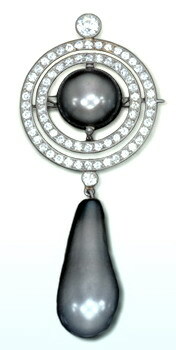 The "Drexel Pearl" was incorporated into its Belle Ãpoque pendant-brooch setting in the year 1905. Thus the Tahitian black pearl would have been discovered from the black-lipped oyster in one of the Islands of Tahiti a few years before this, probably between 1900 an 1905. Around this time all the five groups of islands in French Polynesia were under the sovereignty of France, and were officially known as "The French Settlements in Oceania." 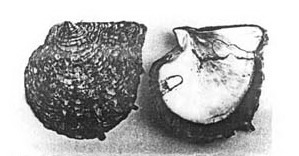 It is difficult to say in which Island group the Drexel Pearl exactly originated, but given the fact that intensive harvesting of pearl oysters was abandoned in the 1880s in the Tuamotu archipelago, the natural home of the black-lipped oyster, there would have been sufficient time for the regeneration of black-lipped oyster populations in the main atolls of the archipelago, including Hikueru, a natural breeding ground for black-lipped oysters and the center of the Tahitian pearl industry for over a century. Thus it was quite possible that the "Drexel Pearl" still originated in one of the reef-lagoons or atoll lagoons of the Tuamotu archipelago. The black-lip pearl oyster is a bivalve mollusk, having two shells or valves that house and protect their soft body parts. The shells are black in color with lighter striations. The nacre on the inner surface of the shell is silvery, which becomes black towards the rim. Hence the name black-lip oyster. They are usually found in reef habitats, attached to hard substrates, sometimes as deep as 40 meters. The black-lip pearl oyster has a wide geographical distribution, in the tropical Indo-Pacific waters from the Persian Gulf to the Gulf of California in Mexico, and from Japan to the southern Pacific Islands of French Polynesia. The species reaches its greatest abundance in the atoll lagoons of Eastern Polynesia, from the Tuamotu-Gambier archipelago of French Polynesia to the northern group of the Cook Islands. The species is also found across the northern coast of Australia, from Champion Bay in Western Australia to Moreton Bay in Queensland. There are seven identifiable varieties of the species Pinctada margaritifera, each having its own discrete range. The variety of Pinctada margaritifera found in the atoll lagoons of Eastern Polynesia, is cumingi, after Hugh Cuming the naturalist who first described it. Pinctada margaritifera cumingi is the largest of the seven varieties of Pinctada margaritifera, that can grow up to a maximum size of 30 cm (12 ins) in diameter and weigh up to 5 kg (maximum recorded weight 9 kg), and may have a life span of up to 30 years. The oysters maximum pearl-productive period is when the oysters age is about 3 to 7 years and has a diameter of 15.2 to 20.3 cm (6 to 8 ins). Pinctada margaritifera cumingi is the source of the renowned black Tahitian natural as well as cultured pearls. The pearl oysters start life as males and change into females after 2-3 years. The mature female oyster (more than 2-3 years old) releases millions of eggs into the surrounding water, which are fertilized externally by sperms released by the younger males (less than 2-3 years old). In any given pearl population, the ratio of males to females are roughly equal. Every year the gonads of the oysters, which are the reproductive organs producing eggs and sperms, become functional only for a short period of five months extending from October to February. Thus fertilization is restricted to only this period of the year. The fertilized eggs undergo a series of cell divisions and develop into free swimming larvae which are released into the aquatic environment when the eggs hatch. The larvae pass through various developmental stages as they remain free swimming in the water, and after 24 days become a D-shaped larva known as a spat. The spats settle at the bottom of the reef where they crawl, while metamorphosing into a juvenile pearl oyster, that attaches itself to the substrate, and begins to develop a shell. Black-lip oysters are filter feeders, that feed by filtering water across their gills, trapping plankton and other digestible materials. The oysters become reproductively mature in 2-3 years, and pearl productive from 3-7 years, when the diameter id 6-8 ins. (15-20 cm). The black body color of the pearls is caused by black melanin pigments secreted by glandular cells, during the nacre building phase. The melanin pigments bond with the conchiolin, the protein part of the nacre, while the aragonite platelets remain colorless and transparent, through which the black color shows through. Besides the black body color, Tahitian pearls can also have other body colors, caused by other pigments. 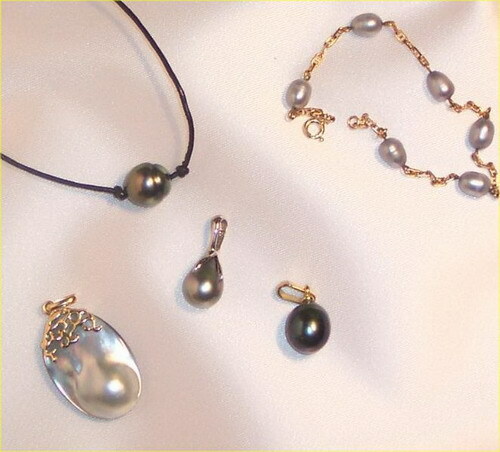 The predominant basic colors of the Tahitian pearls are black, gray, blue, green and brown. Another characteristic feature of Tahitian pearls, is that besides the basic color, the pearls also have beautiful overtones, caused by the interference of light. Some of the common overtones seen are blue, pink, gold, silver, reddish-purple (eggplant color) and peacock green. The overtones are found in a variety of combinations, and their presence enhances the value of a pearl. The finest black pearls having a green overtone, known as the Peacock-green is the most sought after color in Tahitian pearls and the most valuable. The next most valuable combination is greenish-gray known as Pistachio. A gray or black pearl without any overtones is almost 50% less valuable than one with overtones. The "Drexel Pearl" the subject of this webpage is said to have a silver-gray color, with a pinkish overtone. 1) The outer surface of the shell is black colored, with a non-nacreous border. 2) The external shell often shows lighter striations radiating from the umbo. 3) The silver nacre inside the shell becomes dark or smoky towards the distal rim, from which the name black-lip has been derived. 4) Absence of hinge teeth. 6) The shell valves are moderately convex. Mary Stretch Irick who was born in 1868 in Vincentown, New Jersey, was the daughter of General William Hudson Irick and his wife, Sally Stretch. They live on a 240-acre plot named "Locust Grove" on Retreat Road. Mary who was well known for her horse riding abilities, married George W. Childs Drexel, the youngest son of Anthony Joseph Drexel, on November 18, 1891, at the age of 23. The marriage that took place at the Trinity Episcopal Church on Mill Street, Vincentown, was solemnized by the Right Rev. Bishop Scarborough of the Episcopal Diocese of New Jersey. It is said that in preparation for Mary's wedding, a special wing was added to Irick home on Retreat Road, to accommodate the officiating Bishop, and another extension was built for the Trinity Episcopal Church, at Mill Street, to accommodate all the guests. 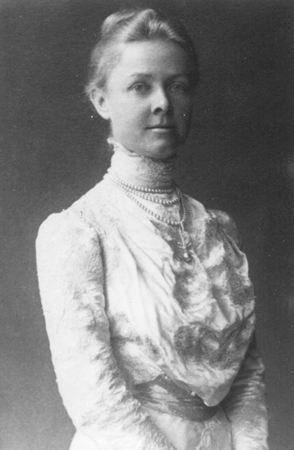 Mary wore a double star of diamonds at the wedding, a gift by Mrs. Ellen Anthony Drexel, the groom' mother, who was seriously sick at the time of the wedding. The wedding gift from the groom's father, Anthony J. Drexel to the newly wedded couple, was a three-storied magnificent mansion, to be built at the northeast corner of 39th Street and Locust Street, at Philadelphia. Today, this former Drexel Home is the Alpha Tau Omega Fraternity House, on the campus of the University of Pennsylvania. Anthony J. Drexel (1826-1893) was a financier, banker, partner of J.P. Morgan and founder of the Drexel University. Anthony J. Drexel also went into partnership with George William Childs (1829-1894) and purchased the Philadelphia Public Ledger, a little known newspaper, which late became one of the most influential journals in the country. Anthony J. Drexel's friendship and partnership with George William Childs, was a lifelong partnership that lasted 40 years. Their friendship was so close that Anthony J. Drexel named his youngest son who was born in 1868, as George William Childs Drexel. Together they engaged in philanthropic activities that benefited a lot of hospitals, educational and charitable institutions. After Anthony Drexel's death in 1893, Childs served as the second president of the Board of Trustees of Drexel University, succeeding the founder. George Williams Childs Drexel and Mary Stretch Irick Drexel were notable patrons of the arts, and extended their patronage, to the Metropolitan Opera Company and the Philadelphia Orchestra. Her contribution as Director of the Philadelphia Red Cross was well recognized. George William Childs, the publisher, gifted a home named "Wootton" in Bryn Mawr, Pennsylvania, to his namesake George William Childs Drexel and his wife Mary Stretch Irick Drexel, before his death in 1894. This home presently houses the St. Aloysius' Boys' School. George and Mary's philanthropy also benefited Mary's hometown, Vincentown, New Jersey. In 1923, she built a library at Vincentown, which she named after her mother Sally Stretch Keen. George and Mary Drexel also donated a large number of books over the years to the library. Mary Drexel died at the age of 80, and her portrait along with that of her mother Sally Stretch Keen, hang in the Vincentown Library. The "Drexel Pearl" presently owned by Andrew Cohen S. A. was loaned to the Smithsonian's National Museum of Natural History, for the "Allure of Pearls" exhibition that was held on the second floor of the Geology, Gems and Minerals Hall, from March 18 to September 5, 2005. This exhibition that was co-sponsored by GIA, Paspaley Pearls Pty. Ltd. and Iridesse Pearls, brought together 12 of the rarest pearls in the world, some with an ancient historical provenance. 1.The Biology and Culture of Pearl Oysters (Bivalvia Pteriidae) - M.H. Gervis, Neil Anthony. 8.Aquafarmer Information Sheet - Producing Pearls Using Black-lip Pearl Oyster - by Simon Ellis & Maria Haws Ph.D.
13.GIA Events & Trade Shows - The Allure of Pearls, Smithsonian NMNH, Washington D.C.